I have done small wedding gigs here and there before for friends: name cards, invitations, save the dates, bridal shower invitations, bridal shower stationary, and more. However, this was the first time that the bride trusted and relied on us to bring her vision to life. Kate’s only been telling us about her rustic vintage glam barn wedding for over a year now. Did I mention this was for my brother’s wedding? So the pressure was definitely on! This also marked the first time my sister, Marjorie Pleta, and I actually became serious about our long-talked about dream of our Mark It line! We usually craft things here and there: paintings, drawings, and handwritten signs. After we’re finished our DIY projects, we’d always say Mark It (MARK for MARjorie and Krystle). I told her how awesome it would be if we could take our hobby and make something of it. However, this wedding turned our dream business into a reality. Since Marjorie and I both have full time jobs and kids, we mostly divided and conquered. The best time for us to work is when our kids are asleep, and that’s what we did for most of these projects. We were able to do some projects together, and the biggest project (the chalkboard backdrop) was definitely an all hands project. My projects included: wedding ceremony program design, menu design, favor tag design, and a few chalk board signs. “DO-NUT leave without a treat!” Wedding Favor Tags for the donut treats. These were Marjorie’s projects: ceremony banner, photo guest book chalkboard signs, seating charts, and table numbers. Then there was the MASSIVE CHALKBOARD BACKDROP. It was built by Kate’s dad: Albert Cabrera, painted by Kate and Roy, designed by me, and executed by the whole team: Marjorie Pleta, Melissa Geronimo, Kate Ricasa, Roy Ricasa, Edel Tabion, and me. It took hours and hours of work, but it was worth every minute of it. We are very happy and proud on how it turned out. The beautiful couple: Kate and Roy! Overall I believe it was a success! I am so happy that the Bride and Groom were happy with how everything turned out! 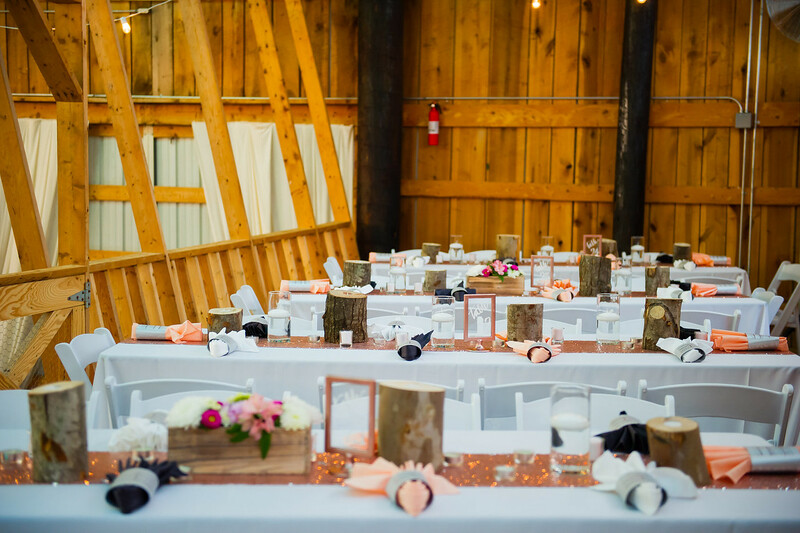 It was the look that the bride envisioned: a rustic glam barn wedding! ….And most of all to my loves doing late night DIY sessions, donut stuffing, invitation assembly line,..the list doesn’t end thank you to each one of you! We love you all. Everyone’s part small or big means so much to us. We’re so blown away by our talented team of professionals they all did an amazing job pulling everything through! Thank you to my wonderful sister-in-law, Kate Ricasa, and brother, Roy Ricasa, for trusting us to design your wedding. Kate has done so much for us, and it’s great to finally be able to give back. (Did I mention she is the best make-up artist in the DMV Area? Her webstie is: http://kater2you.com/.) Kate is perfect for my brother, and I’m glad that they were able to have their dream wedding. I love you both! Congratulations on your 10 years of marriage. Ceremony: Holy Rosary Catholic Church Washington D.C.